This page talks about the way TechTravelHub started and my role about the same. Way back 2005, I joined in an IT company as an automation test engineer and started learning QTP [a popular test tool]. With the strict internet access policies,I was not allowed to access all sites!!. As I was heavily dependent on google to get help, I was badly needed for a place where I can dump all my code. [Some I wrote,Some my mates or some collected from Internet ]. Mostly these codes was to automate my application under test. There were no smart phones those days and Access to those phone in office hours were very strict. I was looking for a place holder rather a site which was approved by office network and allow me to put my code into their domain. I found blogger is the perfect platform for me. I did not have any idea what blog was for.I just used it to dump different codes to perform better in office. Within a few days my blog grew bigger. Everything was going fine. Then suddenly I earned a bad name for stealing the content. I did not know blog was for unique content. I discovered that there were people following me,more over google started delivering visitors to my blog. I was in game!!!! Later in 2017, when I started learning new tools, I understood, it is not only QTP, I am posting. There are lot more. changed the name to My Digital Voice. AskQTP is new MyDigitalVoice. With the advancement of my career, I learned so many new technologies[Selenium,AutoIT,Java,QTP,UFT,Jenkins,Hudson,Perforce etc]. Even though I started this blog to help myself into QTP and named accordingly,now it is time to move ahead. I have started building my blog.I have started sharing.New and fresh most importantly my contents are on the way.I have started following different forums and try to find the resolved and unresolved queries to solve them. I answer most of the question asked to me either as a comment or in fan page. Finance [Stock,Mutual Funds,Share] is more interesting area where I am going to concentrate followed by photography. It took years for me to understand the concepts.I started to roll back the reused codes according to unique content rule. Mostly I update periodic update about my blog here. 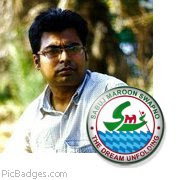 About Myself: I am Animesh Chatterjee 30 years old writer,by profession an IT employee working as a test lead in a product base MNC.Love to learn and unlearn new and old things. I like to read the history,like to travel around corner,a big time foodie and a novice photographer. Apart from these I like modification on Cars [Interested area-Light].A gear head with Bike-Pulsar180 and Car Ford Figo.